Virtually every commercial big-rig truck rolling down the highway these days is carrying goods that can represent hundreds of thousands of dollars, if not more than a million. For cargo thieves, those are inviting targets that are easy to attack, and in many cases the products can quickly be turned into cash on the black market. It’s an ever-evolving threat to motor carriers. Keeping cargo safe means defending against not only traditional methods but recognizing and overcoming emerging new tactics and techniques increasingly employed by the bad guys. These can include social engineering, “spoofing” technologies, identity theft, fictitious pickups using bogus shipping documents in which thieves impersonate legitimate drivers and companies, and criminals doing covert, organized site surveillance and intelligence gathering to plan a heist. “There are some things about cargo theft that haven’t changed that much over the years,” said Scott Cornell, who as crime and theft specialist at Travelers Insurance leads the company's transportation business and helped create its cargo theft investigation unit in 2005. Yet there have been significant changes, he said, including targeted commodities, technology-enabled cargo theft and criminals organizing into more sophisticated and dangerous groups. It’s enough to keep fleet safety and security managers up at night. However, the most effective defense against cargo theft is an educated, alert and aware driver. And that’s where fleets continue to spend time, effort and money to support drivers, keep them safe and their loads out of harm’s way. According to Sensitech’s second-quarter 2018 U.S. and Canada cargo theft analysis, 157 cargo thefts were reported in the period, slightly down from 2017. The average cargo value per theft event was $186,779 for a total of $29.3 million in losses. The thefts involved 342 stolen vehicles, including 120 semi-tractors and 155 semi-trailers. The most targeted goods: food, building supplies, household goods such as appliances, and electronics, including computers and televisions. Major over-the-road fleets engage drivers in formal training and education programs for safety, cargo security and theft prevention. Every driver with CFI undergoes orientation that stresses personal safety as well as cargo and equipment security, said Jeff Messer, security and safety analyst at the Joplin, Mo.-based truckload carrier, which has 2,000 drivers. The company communicates regular updates to drivers on cargo theft trends, prevention techniques, “hot spots” for theft to steer clear of or be extra vigilant about when dropping or picking up a load, as well as law enforcement bulletins and other safety-and-loss-prevention intelligence. Messer’s prevention tips for drivers: Always be aware and attentive to your surroundings. Be well rested. Use the restroom before departing. Have snacks already in the truck. Preplan your first stop. Do a thorough walk-around inspection of the truck — before and after any stop — and be fueled up prior to picking up a load. In a situation where a driver encounters a theft in progress, Messer says to call 911, then call the company security hotline. “A good witness is better than an endangered driver,” he said. CFI, similar to other carriers and security experts, recommends that upon departure, drivers travel without stopping for a minimum of 200 miles. A thief may trail a truck for an hour or so, but seldom will a thief go beyond that because most personal vehicles will need to stop and refuel. The company’s trucks also are equipped with GPS and devices that can be activated to render the truck inoperable. 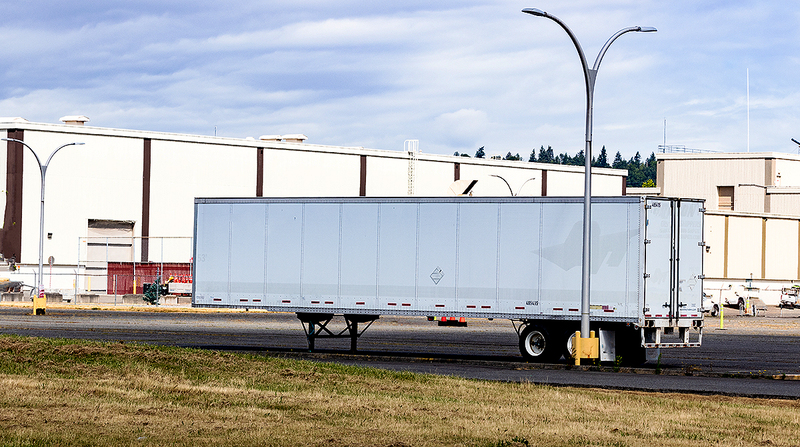 While the highest incidence of cargo theft tends to occur on the full-truckload side of the business, less-than-truckload carriers are not immune. In the LTL arena, the threat is mostly internal, where an employee may be approached by an outside perpetrator and encouraged to collude with the thief in a scheme involving a customer or goods at the trucking terminal. The key to prevention is regular, constant communication with all employees, ensuring they are aware of proper security and threat prevention procedures and protocols, said Geoff Stephany, director of cargo claims and security for Thomasville, N.C.-based Old Dominion Freight Line. “If you see something suspicious, know who to call and what to do,” Stephany said. The fleet preaches “see something, say something,” he said, noting the company’s top deterrent is informed and educated employees. ODFL ranks No. 11 on the Transport Topics Top 100 list of the largest for-hire carriers in North America. Meanwhile, there are two common types of cargo theft, Travelers’ Cornell said. A “straight” theft is one in which the cargo is stolen from the location where it sits. These usually are crimes of opportunity, in which a thief is looking for whatever can be stolen easily and sold quickly. Crimes such as these usually occur at a truck stop, a drop lot or other area where cargo is left unattended. The most common: a store parking lot or unsecured empty lot where a trailer is parked for the weekend, awaiting a Monday delivery. Countermeasures include not leaving trailers unattended or unmarried to the tractor, especially in remote or unsecured areas, and using high-security rear door locks and air cuff locks, Cornell said. Also, if the trailer can’t be moved to a secured area, or to the consignee’s secured warehouse and lot, consider installing landing gear locks as well. The other category, Cornell said, is “strategic” cargo theft. This method continues to evolve rapidly and is one in which the perpetrator is using deception or unconventional methods to trick the shipper, broker or carrier into giving up the load. One of these emerging techniques involves “social engineering.” In this case, the thief scours the internet for specific products, companies and warehouse locations while looking at public load boards for specific loads that match the products they want to steal. Thieves may even post false loads to load boards and solicit bids to get the information on the carrier they need to steal an identity, according to Cornell. Cargo thieves often look for loads late in the afternoon or on a Friday, figuring that the traffic manager is under pressure to get the load off the dock and will be less diligent in checking the bona fides of the driver. In this case, the perpetrator is impersonating the legitimate carrier. The thief shows up at the shipper an hour or more before the scheduled pickup, saying he’s early and wants to get on the road. The thief then will present forged paperwork, and in some cases may have the truck logoed and painted in the livery of the true carrier to appear legitimate. The shipper, not knowing it’s a fictitious carrier, lets the shipment go. Double-brokering scams, identity theft, deception schemes and organized crews doing targeted surveillance, as well as hybrids and combinations of these, are examples of strategic cargo theft tactics being used by sophisticated perpetrators. • Research carrier information though legitimate sources including the Federal Motor Carrier Safety Administration, third-party vetting companies and industry associations. • Work only with legitimate and licensed brokers that have strong controls in place for vetting carriers, ensuring their legitimacy and protecting cargo security. • Always check for positive driver and truck information at the pickup point. Verify the driver, truck and pickup confirmation numbers. If any suspicions arise, call the carrier or broker to verify and confirm the veracity of the driver. If the driver tries to give you a number, saying, “Here, call my dispatcher,” don’t use that number. Use the confirmed number and contact you already have for that carrier or broker. Nick Erdmann, business development manager for Transport Security Inc., has found that most thefts are planned. “Most thieves know what is coming out of a certain area, what’s being shipped,” he said. His company provides high-security trailer and container locks, truck locks and covert GPS tracking technologies. Often, a thief will scout a warehouse or trucking company terminal, watching and recording when trucks arrive and depart, and when cargoes would be most vulnerable. Sometimes thieves will even test a site’s security measures, purposely setting off a perimeter alarm and then seeing who reacts and how long it takes for law enforcement to arrive. That information is used to plan the heist. Another tactic: marking a trailer with a Sharpie pen or spray paint, essentially tagging the trailer, or attaching a portable GPS tracking device, hidden on the trailer. The thief then follows the trailer, and when parked, either breaks into it or steals the entire trailer. As for ODFL’s drivers, Stephany coaches on the fundamentals. Never leave a truck’s cab unlocked — even when moving. Always lock the trailer after every stop.